Plan Your Birthday Parties At BTJ's Jungle Pet Shop! Does your animal-loving child have a birthday coming up? B.T.J.’s Jungle of West Islip, New York – your one-stop pet shop – would make a great place to have an unforgettable, affordable birthday party. Both your birthday child and guests will love playing with all of our adorable animals. They will even learn some interesting facts about animals, as well as learn about pet ownership. Included in our children’s party package is a safari adventure of our store that features an introduction to some of our most beloved animals such as birds, hamsters, reptiles, bunnies, fish and more. We can customize a safari tour to the birthday child’s particular interest by focusing on specific animals to hold and feed. 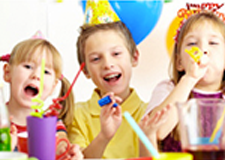 Our party package costs an affordable $199.00 for a party of 12 children. We find the parties are best suited for kids 12 years old and younger, although all ages are welcome. The length of parties varies, but each party generally lasts a little more than an hour. To the delight of your guests, each animal-loving guest will receive a Betta fish as a token for coming. At this time we do not have party room at our Long Island store located at 144 Sunrise Highway. However, most guests take the party across the street to McDonald’s for some extra fun! Our staff is friendly, helpful and knowledgeable, and they’re always eager to assist in making a fun and educational experience for you and your children’s party guests. Why have a birthday party for your child at your home when you can have a party that both captivates and educates your young guests? Please call us at B.T.J.’s Jungle for more information and a free quote today at 631-587-8191. You can also fill out our easy contact form on our website for more information. We look forward to hearing from you soon!